What a joy it was to welcome Nimo to London once again in September! As always, it was a heart-filling week of gatherings engaging people of all ages and from all walks of life. Our week opened with an Empty Hands Music gathering on World Peace Day, September 21st, at the Museum of Happiness! 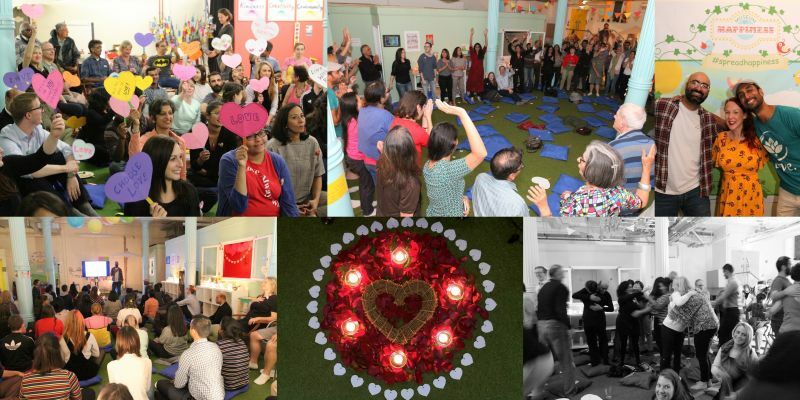 The next day we welcomed parents and children to come together for our second Kindful Kids Circle where Nimo shared stories and planted seeds about gratitude. Finally the last day of his trip concluded with an Awakin Circle, where he shared nuggets of wisdom and inspiration from his personal journey of service. On the 21st of September 2018, over 100 people from all walks of life came together to cultivate world peace! We celebrated with a very special peace concert with the amazing Nimo and a loving-kindness meditation for the world. We linked up with some incredible young people in Afghanistan who were about to do a “heart march” risking their lives to walk through the dangerous streets of Kabul, with hearts and peace signs standing up for world peace. Our hearts were warmed by their courage and inspired by their outlook, “we are just as likely to die scared in our houses, we have to stand up for what we believe in and march for peace, and if we don't, what message does that send to our younger brothers and sisters! ?” Very inspiring young people (who are all safe and leading the way as brave peace warriors)! All the guests were so inspired by the young people that they wanted to send their support and sent this message of love and encouragement to them! Two amazing ladies in the community Trishna and Ani (who anchor the ServiceSpace community here in London), who have supported us soooo much on our journeys, surprised us at the end of the event by showing a video capturing all of the magic that we have co-created together this year! Our hearts melted! It was such a joy for our family to welcome nearly 40 parents and children all to our home to spend an entire afternoon together planting seeds of goodness in the hearts of our families. As they say, it takes a village to raise a family, and we feel blessed to have these opportunities to come together and cultivate the values we all hold dearly through these Kindful Kids Circles. Following our first Kindful Kids Circle, which was all about kindness, this time it was so beautiful to look at the other side of the same coin as we collectively reflected on gratefulness and how we can deepen our gratitude for the simplest moments and things we are gifted in life. For our opening circle of introductions, we passed a basket with everyone's names on slips in it and everyone picked a name and invited that person to introduce themselves and share one thing they are grateful for, which created a beautiful foundation for the rest of our time together. Following this, Nimo offered many stories and beautiful reminders for parents and children alike about what it means to be grateful and how we can practice this more consciously in our lives so that eventually it become natural. He also brought up an interesting point about how complaining is an act of being ungrateful, so in order to be grateful in a pure way we should be mindful to try to complain less in our lives. Parents and kids made a pact to take this on board, as they hadn't really looked at complaining in this light. All of the families had a wonderful time joining in with a few of Nimo's songs throughout our time together, learning all the hand actions to accompany them, making them even more unforgettable :) Following "Planting Seeds," the children gathered around the meditation bell in a circle as the parents held them all in an outer circle in silence. As parents held the space with silence, the children each took turns striking the bell, holding onto the striker until the sound had dissolved and then passing it onto the person next to them. It was so sweet to hear the eager anticipation of some of the children and to see how beautifully they could hold that space for each other as well. It was beautiful to see everyone embrace the opportunity to practice gratitude right then and there at the gathering as we took the time to write Thank You cards to somone who touched our lives in some way. It was lovely to see many folks even ask if they could write another card when they finished the first one, as their cups of gratitude were overflowing and they felt moved to keep sharing the love with others. And of course no gratitude circle is complete without singing "Grateful" together in a circle! The parents and kids loved learning the hand actions for the chorus and sang along with so much love! After eating and chatting as everyone said their goodbyes, each family took home their own gratitude journal as a gift to nurture the seeds that were planted together at the gathering. Following the Kindful Kids Circle, we all did a 21 Day Gratitude Challenge together as well, which was a lovely way to nurture the ripples and remind us of ways we can integrate gratitude into our family's lives. My kids have always connected so lovingly with Nimo and it was a gift to be able to share Uncle Nimo with all the families who gathered. Thank you Nimo for blessing the families at the Kindful Kids Circle with your incredibly inspiring and humbling presence. Your offering of songs and words of wisdom on gratitude were a gift for all of the families and will surely ripple out for weeks and months to come. It was wonderful to gather for a magical Awakin Circle with Nimo with many familiar and new hearts coming together to be in stillness and listen to Nimo share from his heart. We are so grateful to dear Nimo, for sharing his lived wisdom so open heartedly with authenticity and humility. It is so so humbling and refreshing how he continues onwards on this pilgrimage, without expectations, without a destination. The conversation, beautifully guided by Ewa, unfolded a wealth of inspirational nuggets from Nimo’s personal journey, allowing a glimpse into the processing behind how he continues to effortlessly walk a journey in service aligning core heart values with intention and meaningful purpose... the outer service work being a means for going deeper into his inner journey, towards purification. The sharing held intense resonance and left imprints on all who were present. Growing up in an ethnically diverse suburb of LA, he saw the commitment his parents, as second generation Indians living ŷin the USA, had in nurturing their values, roots and identity for the benefit of their family and the community. As open minded and open hearted parents, his mum and dad continually planted seeds of service and compassion by carrying out acts of kindness for others. These were just a few seeds planted during formative years. Writing poems and songs to express emotions came naturally at a young age. His first song at high school was on the academic subject of Calculus. :) By the time he was in college, Nimo and friends had formed a successful globally recognised hip hop band called Karmacy. Certain trigger points, such as the events of 9/11 during his “successful” career in Wall Street, writing script for his animation studio that would sell for Hollywood, the content of which was often violent, negative or harmful, felt misaligned as they pushed further away the values that were dear in his heart. These trigger points started shifting his lens inwards towards asking deeper questions around whether the choices he was making and all he was doing was what he believed in. Health issues with hands led him to India for Ayurvedic treatment for 6 months. Here, his heart led him to seek out Manav Sadhna, an NGO based in the Gandhi Ashram, which he had first come across in 2002 when it brought a Gandhian values based dance drama show called “Ekta” to New Jersey. His passion for performing arts led him to connect with Manav Sadhna as a volunteer with an intention to create a similar show called Ekatva. He shared beautifully how the journey of Ekatva evolved into a journey of connection with the 16 slum children and their families. During this time, Nimo steadily continued to walk on a humble journey of outer service, with equal dedication to carrying out small experiments to work on himself through personal practices. He shared how these experiments illuminated areas of suffering, leading to holding questions of where the suffering was from, what’s causing it and how can he reduce the suffering. “It’s never external.. it’s all the wiring inside.” It was heartwarming to learn in the Q&A session how Nimo is noticing the value in finding balance between doing and being. The conversation was enriched with insights and learnings, yet we had barely skimmed the surface of Nimo’s journey. If there were a Part 2 after dinner, :), we could have learned more about the inspiration behind Empty Hands Music and Jai Jagat. Deeply grateful for these gatherings with noble friends. They are an abundant source of nourishment for the soul. Enjoy photos from our Awakin Circle with Nimo! We can't wait to welcome Nimo back again to London!